What's Holding Back Your Growth? How many have you already cleared? Failure to clear these can keep your business from growing... or worse! 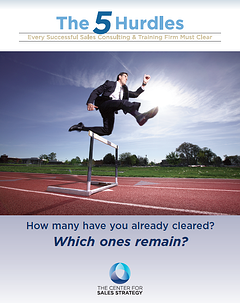 Download The 5 Hurdles Every Successful Sales Consulting & Training Firm Must Clear to find out more about these Hurdles and learn some tips on clearing each. Do you know someone that might be interested in this eBook?